Spielberg is the public conception of cinema, you ask the average person about their favourite directors and they will probably say Steven Spielberg. In terms of popular movie culture he is about as iconic as you can get with a string of movies that brought about and defined summer Blockbusters. With perhaps only one or two out and out failures Spielberg has become synonymous with cinematic quality, a benchmark for populist directors the world over. So why does he on the DVD release for his latest film have to defend his creative choices in a five minute long introduction? Following his string of successful family orientated films in the late 70s and early 80s Spielberg would start to move on to more cerebral fare, ditching his aliens, killer sharks and daredevil archaeologists for true life stories about POWs, the Holocaust and the brutality of the World War Two. There is still the occasional piece of crowd pleasing fodder, Jurassic Park for one, but The Colour Purple marks the start of Spielberg’s ‘growing up’. There is not much really to say about Schindler’s List or Saving Private Ryan and the justification for my positive opinion of both A.I. and Minority Report would entail me writing yet another two or three paragraphs of introduction. These films shape the course of Spielberg’s maturation and allow for the existence of Munich, a film which conflicts with Spielberg’s back catalogue on a basic tonal and aesthetic level. The Cinéma-vérité elements of Schindler’s List and the harrowing, brutal and honest violence of Saving Private Ryan are the key considerations when viewing this film, a treatise on the nature of escalating violence and ‘eye for eye’ politics. 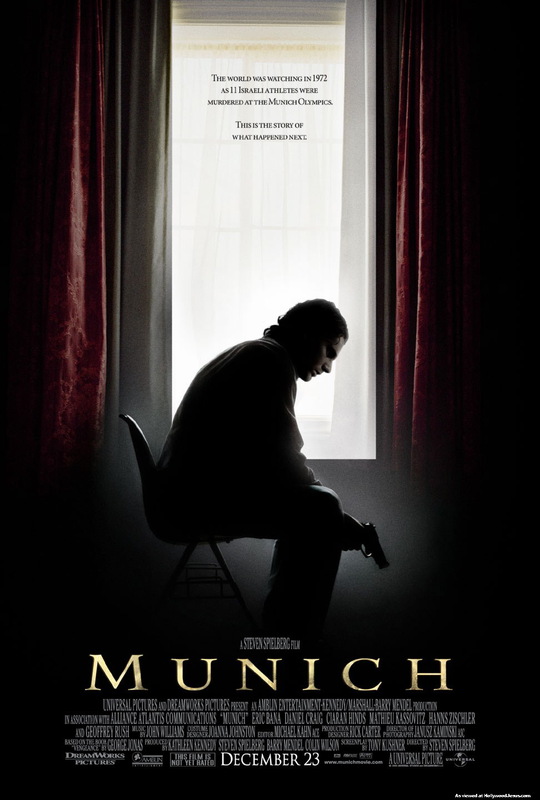 Munich starts quietly, a simple act of intercontinental charity kicking off the horrific event that will become the catalyst for everything to follow. Flurries of media reports relay the situation as Palestinian terrorists kidnap and hold to ransom the Israeli Olympic Team. We already know what is going to happen, the brutality of the Munich Hostage Crisis of 1972 burnt into the public consciousness enough to allow Spielberg to focus on presenting reaction to the event rather than summarising what happened. The subsequent firefight between Munich police and the terrorists, and the murder of all eleven hostages will be dramatised later in the film but our opening experience with Munich is that wild media frenzy. As I said earlier, the film is not really concerned with documenting the factuality of the terrorist action and instead uses the massacre as a catalyst for its ruminations on vengeance and escalating violence. Avner (Eric Bana) is a young Mossad agent whose low profile offers him the potential to operate without suspicion on a state funded revenge mission. Hired to eliminate eleven key members of the Palestinian Terrorist group ‘Black September’ responsible for the Munich kidnappings. Resigning from his job and becoming exiled from his home country of Israel Avner finds himself in command of a four strong team with the prerogative to pursue and eliminate his targets in any way he deems fit. That is about as much plot as I need to go into, anymore and I’d just be rambling. The majority of the film follows this mission, as Avner and his team journey around Europe buying information and carrying out both public and secluded executions. As you would imagine from the director of Saving Private Ryan and Schindler’s List Munich is hardly an Israeli version of Delta Force. The action in Munich is punctuation, messy, unflinching and never particularly pleasant. 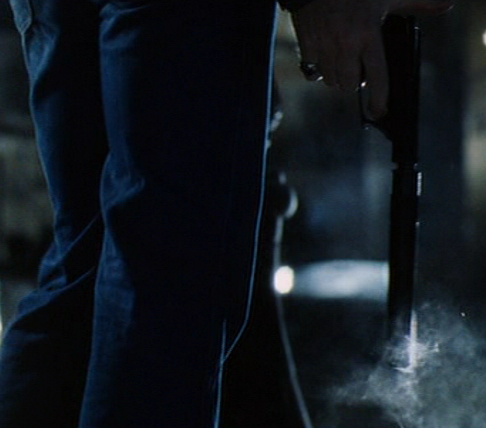 Spielberg is a master of composition and he uses this to present violence in two distinct styles. Certain acts are carried out with an unreal melancholic grace, the first assassination being a prime example of artistic licence adding emotional truth to a scene. The target, gunned down in his hotel lobby whilst carrying his groceries home, pleads for his life two shots ending his life and leaving his body to fall dramatically onto the floor, milk and blood mixing as his groceries and bodily fluids spill out in front of him. There is a forlorn poetry to the entire scene that makes the directors opinion on retaliatory violence crystal clear. When not going for artistry, the film opts to showcase violent events in a subjective way. Two key moments in the film, a bomb blast in a hotel and a Mossad assault on a Beirut fortress, are filmed in a distinctly documentary style. The camera pulled back from the action to allow for a distanced reaction to what is occurring onscreen. There is a brutal banality to both of these scenes, particularly the way in which a Mossad agent finds a wounded Palestinian and compares him to a photograph of one of the targets before summarily executing him. The dispassionate way these scenes are executed only highlights the humanity of the film, and the way it is slowly eluding our central characters. Avner is an easy entry point for the audience, his initial feelings of cognitive dissonance synching up with audience perceptions. We’re meant to question the retaliation from the first kill onwards and Avner initially joins us in this uneasiness. His hesitation to kill, despite his training as a soldier, showcases the same sense of uncertainty about the justness of the cause that we the audience are feeling. Balancing Avner are the conflicting ideologies of his team mates, in particular the fiery Steve (Daniel Craig) who rejoices at every Arab killed and the reticent Carl (Ciarán Hinds) who balks at initial celebrations over the death of the first target. As more and more of the executions are carried out Avner becomes increasingly disassociated, his initial dilemma at the gunning down of a target slowly giving way to a man willing to shoot his targets down in the street and use brutal ordnance to get the job done. By the end of the film Avner is a paranoid and schizophrenic wreck, his realisation of the futility of his action and understanding of the recompense soon to befall him twisting his character into a shell of itself. The violence in Munich is cyclical, the Israeli occupation forcing Palestinians to kill at the Munich games, the Munich games forcing Israeli’s to kill around Europe, the Israeli killings inspiring stronger Palestinian attacks which are themselves greeted by more severe Israeli assaults. The characters themselves start to understand this, with Avner’s dreams of the hostage situation changing from being the thing that drives him, to being the thing that hounds him. His final dream, where he imagines the final moments of the Israeli Olympic team, is twisted with guilt at his own contribution to the escalating violence. There is still a hatred of the terrorists responsible, but it is mixed with a sense of self loathing brought about by his realisation of what his mission has achieved, removing moderates from Black September and replacing them with far more dangerous people. That is the answer to the question I posited earlier on. Spielberg introduces the film to try and make people understand that his film isn’t anti Israeli; it is not a comment on Israeli politics as such as it is a comment on the nature of violence itself. Munich is a film that is at once both beautiful and utterly hideous. As a director Spielberg crafts a truly luminous work of art, which is engaging, shocking, occasionally witty and always enthralling. It is a film made with skill and dedication and filled with great performances, particularly from a pre-Bond Daniel Craig and the greatly underappreciated Ciarán Hinds. Eric Bana is a standout in the central role, bringing humanity to a character who is often hard to read and becomes increasingly disassociated from the audience. But it is also a film that is meant to be unpleasant, meticulous recreations of the Munich massacre and brutal, morally contemptible violence making Munich a bitter pill to swallow. This weekend I’ve mostly been cursing the gods of technology as I waged all out war against a posse of brutal Trojans hiding on my computer. After 48 hours of Spyware Checks, Antivirus Runs and Registry Clean Ups, I’ve managed to remove the blasted things (ironically it only took me 20 minutes to sort everything after being sensible and googling some instructions on how to clear a specific virus which had burrowed itself deep into my system archive).Subsequently I was left with large blocks of time in-between the routine of switching to safe mode, spyware/malware checking, rebooting, weeping, and switching back to safe mode. I intended to use this Mobius Strip to catch up on my DVD viewing, but instead opted to watch the Indiana Jones trilogy for the first time in four years. Here are some vague essays and ruminations on each of the films and my thoughts on the trailer for new film The Kingdom of the Crystal Skull. If you ever get a chance to read The Art of Bond you’ll quickly find out that Steven Spielberg has always been desperate to make a James Bond film, even asking series producer Cubby Broccoli twice if he could have the privilege of helming a Bond film. It was this passion for Bond which most likely persuaded him to undertake the collaboration with George Lucas that would become Indiana Jones. Although Indiana Jones is influenced more by old Republic Serials than anything else there are certain elements which make the films seem like an American James Bond. In fact movie folklore suggests that Raiders of the Lost Ark was fleshed out in Hawaii during a conversation between Lucas and Spielberg after Spielberg had confessed of his wish to direct a James Bond film. Harrison Ford holds Raiders of the Lost Ark together, providing a consistent presence in a film that is at times utterly disparate. If you took five minutes from the beginning, five minutes from the middle and five minutes and showed them next to each other you’d swear they were different films. Even the film stock seems to change, which does tie in with the idea of an updated serial. The problem of this disparity is that the quality of the film is constantly changing as well. It may be sacrilegious but I actually think that the start of Raiders isn’t all that great. It only really finds it feet when the action switches to Marion’s bar in Nepal (Indy’s silhouette on the bar wall is also a far more effective introduction to the character than the jungle opening). The conversation with the US government agents and his subsequent interactions with Marion are what shape the character. The following hour is probably the greatest action movie ever made, the search and subsequent chase for the Ark of the Covenant presented almost perfectly. It helps that this hour has four absolutely fantastic set pieces. The bar fight in Nepal, the extended chase around the streets of Cairo, the fight in and around a flying wing and the classic truck chase are all examples of fantastically exciting and character driven action sequences. The truck chase in particular is still incredible even 27 years after it was made. Having the second act loaded with action leaves a problem for the third act, a director either has to come up with an even more impressive spectacle or have a more downbeat denouement. The ending of Raiders sidesteps this by having the climax be predicated on self destruction; Indiana does absolutely nothing at the end. He just follows his instincts and is spared, his intellect finally getting a chance to shine over his determined physicality. Having the film be resolved with a literal interpretation of ‘deus ex machina’ is probably the only way an ending could have been satisfying, it is also kinda hard to argue with a ‘deus ex machina’ ending when it allows graphic portrayals of melting Nazis and exploding French archaeologists. 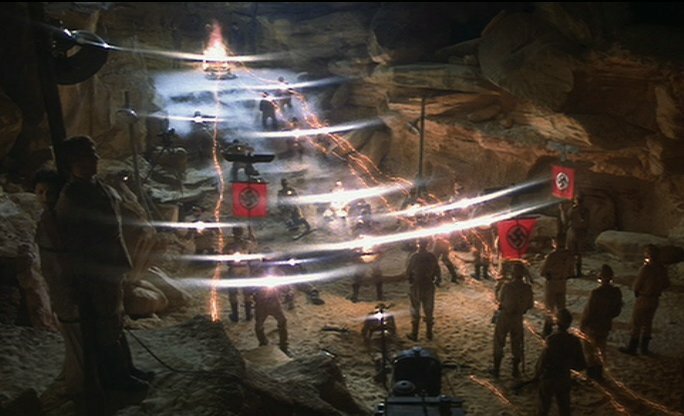 What’s amazing is that the films which tried to ape Raiders of the Lost Ark always paid more attention to the opening tomb raiding scenes and didn’t look at the bits that audiences actually responded to. What makes Raiders work are the extended scenes where Indiana is playing off against other people, whether it be verbally sparring with his rival Belloq, bickering with Sallah or feeding Nazi’s into the rotary mechanism of a flying wing. It’s these moments of humanity which make Indiana Jones so loved, people don’t associate the character with superhuman feats of daring, they associate the character with shooting a swordsman, or struggling to hold onto a truck, or getting constantly outmanoeuvred. It’s this innate failure, the inability to take control of a situation that makes him so relatable to audiences. 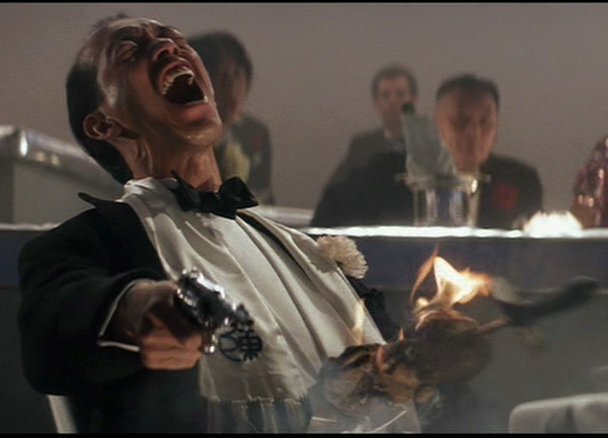 Temple of Doom continues this policy of humanity through strife, with an opening that has Indiana getting poisoned, shot at, and making his escape on a plane scheduled to crash in India. From the moment the film starts you realise it’s a different beast to Raiders. For one thing it looks far glossier and it generally just seems a lot slicker. Opening with a dance number, which segues into a club fight, which segues into a motor chase, which segues into a plane crash the film never lets up pace in its first act. 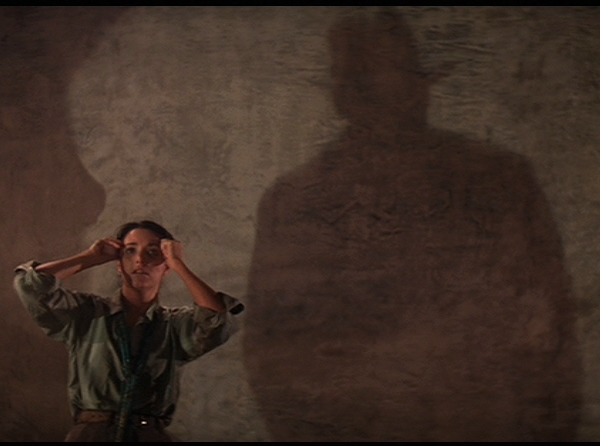 Bizarrely set a year before the events of Raiders of the Lost Ark the film seems to operate in a completely different reality to the rest of the trilogy and the result is that it feels like a diversion more than anything else. In fact Temple of Doom‘s opening seems more like a Bond film than anything else, the world weary archaeologist of Raiders replaced with a charming, highly skilled, and well connected adventurer. It’s a subtle difference, but it’s a difference that is apparent when watching the films back to back. 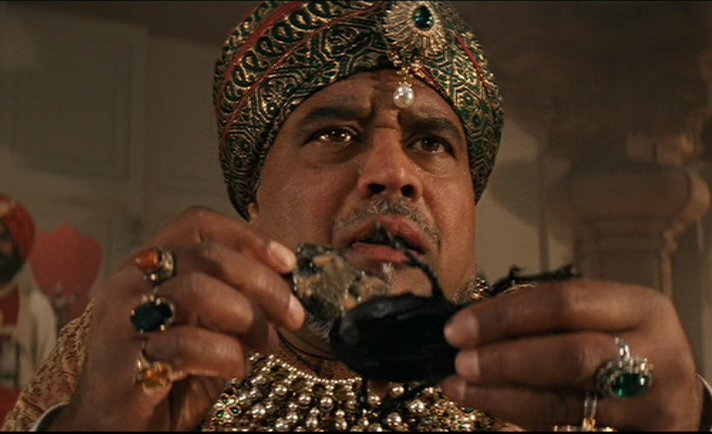 Certainly you wouldn’t expect the Indiana of Raiders of the Lost Ark to be trading in valuable relics for what appears to be a run of the mill (if spectacularly huge) diamond. 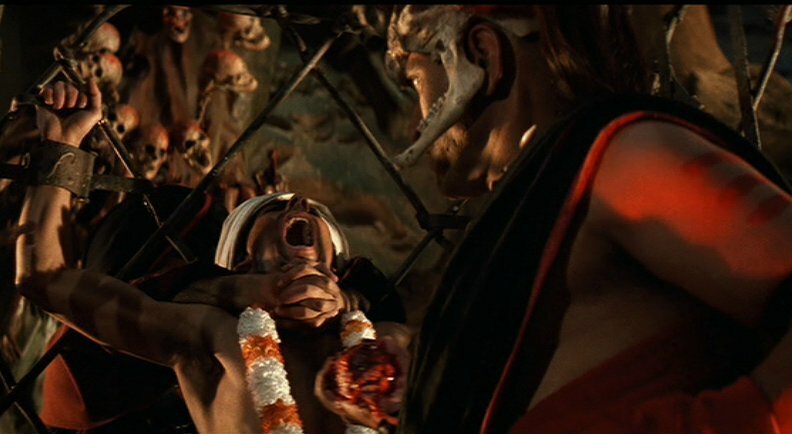 The opening in Club Obi-Wan sets the tone for Temple of Doom, with a peculiar mixture of horrific violence, Indy plunging a flaming kebab into a villain’s chest, and broad slapstick, the ensuing balloon fight and scramble for antidote. Temple of Doom is a far more comedic film than Raiders of the Lost Ark but it’s also a film that prides itself on the horrific. It’s a film with a wisecracking kid sidekick that happens to feature people getting their hearts ripped out by demented Indian priests. film which seems to be aimed squarely at children. The child centric cast and the films utter delight in the gross and grotesque makes it seem like a children’s movie with a few throwaway elements for parents to appreciate. Elements like the food gags (which essentially boils down to the fact that foreign people ate gross food) just reinforce this notion. That’s not to say that Temple of Doom is a bad film, it’s a fantastic piece of escapist entertainment and once again it shows a level of imagination and technical skill which has yet to be really challenged. But compared to its compatriots it just feels too light and from a geeky point of view just seems wrong. Its chronology just seems really arbitrary, especially when you have gags which reference the original film. But Doom also has some truly great moments, the aforementioned mine cart chase truly is something to behold and Molar Ram is a truly terrifying foe, despite his lack of screen time. It’s just that it all ends up feeling like a more splattery Chris Columbus movie and you expect more from an Indiana Jones film. Whereas Templ e of Doom seemed like a diversion for the trilogy, Last Crusade acts like a direct thematic sequel to Raiders. Like the earlier film Crusade is a globe trotting race against the Nazi’s to claim a godly artefact. When I was growing up Last Crusade was always my favourite film, even with the prospect of melting Toht, in the trilogy. 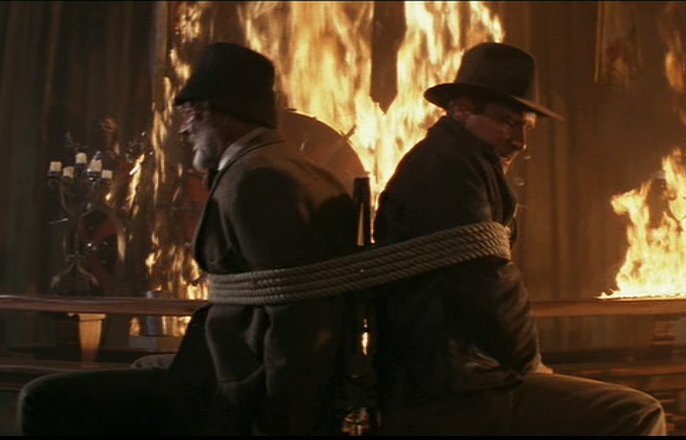 Even today I recognise that Raiders is probably the better made film, but for about two thirds of its running time The Last Crusade is one of my all time favourite films. Whilst I’m particularly fond of the ‘Young Indiana Jones’ segment at the start, everything after until the climatic battle on the tank is just fantastic. Of course there’s the problem of nostalgia with a film like this, especially because it’s one of the first films I ever saw in a cinema. This of course makes it hard to write about in an objective sense, I mean it’s hardly fair to try and analyse something which has the weight of childhood warmth maintaining an illusion of quality. What Last Crusade does is create a middle ground between the ‘serious business’ of Raiders and the broad comedic spectacle of Doom. It’s funnier than Raiders, but it’s also got the thrust and momentum that Doom lacked at points. By thrust and momentum I’m talking more about pacing than content, and pacing is the thing that Last Crusade utterly nails. It’s constantly showing off new stuff, new stunts, new gags, new set pieces, new puzzles, it never really stops for breath and as such it’s easy to get swept up in the films momentum and not notice that at times it seems like an obvious retread of Raiders. 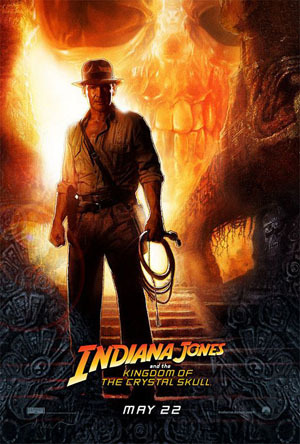 The defining quality of the film is the central relationship between Indiana and his father Henry Jones (played by Sean Connery) who are forced to work together to stop the Nazi’s obtaining the Holy Grail. Henry and Indiana are not on the best of terms; with Indiana trying to constantly win his fathers respect and generally shocking him with his recklessness. There’s a great deal of fun to be had from the conflicting personalities and having Indy fearing constant disapproval from his father adds yet more humanity to the character. This relationship distracts from what is a rather weak overall story, which borrows the plot progression of Raiders wholesale. The minutiae save the film in a lot of ways, with fantastic set pieces at every juncture. 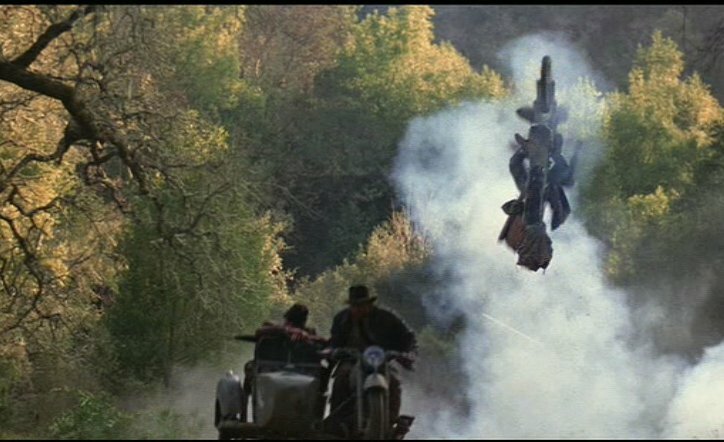 The obvious standouts are the motorcycle chase and the battle in and around a tank, but Last Crusade has a wealth of great little moments. Compared to Raiders it’s still decidedly light and the ending once again takes the resolution out of Indiana Jones hands, which while effective once just seems to be stretching on a second go around. Like Raiders the main set piece of the film occurs way before the end, in this case the ten minute long tank segment. This segment is probably one of my all time favourite action set pieces, just because there’s so much going on. But it’s the little moments amid the chaos which really sell the scene, like Indiana using his whip to stop Henry Jones from being crushed under the tank tracks. 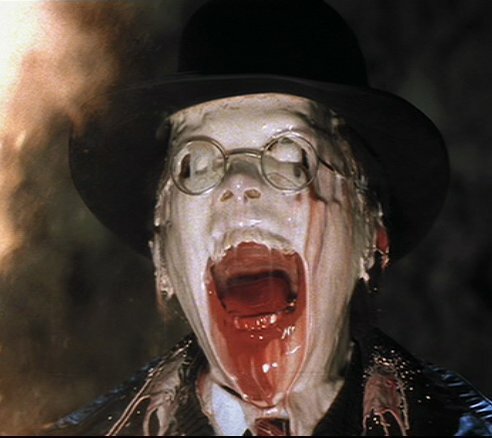 Amidst all the destruction, the explosions, fights and bloodshed it’s that moment that sticks in my mind when I think of Indiana Jones in general. 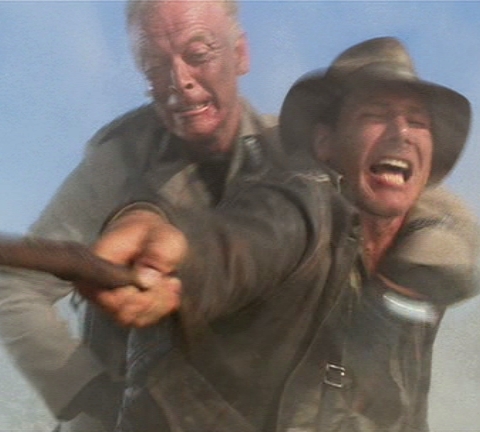 What makes Indiana Jones isn’t the stunt work, it’s the heart, and that’s why nothing has really come close to it. You can find the official trailer for Indiana Jones 4 at the above link. It’s nice to know what there’s a new Indiana Jones film being made; the feeling is amplified after seeing the trilogy over the weekend. Born in 1985, the Indiana Jones films were key elements of my childhood and so I’m genuinely excited about a new film. The knives are already out (go to any message board and you’ll see maddeningly dull threads complaining about Jones quipping and the CGIing of Ray Winstone’s trousers) for the production, largely because the collective geek intelligence wants George Lucas to fail. Making average to mediocre films is a crime for which he will never be forgiven and if Kingdom of the Crystal Skull is anything less than perfect then a lot more childhoods are going to be raped. I don’t particularly have a problem with Lucas, I think he’s a great conceptualist, but then I never viewed the original Star Wars films as anything but frothy kids films. Ideas wise the guy is great and partnered up with Spielberg he’s never delivered a bad film. So here’s to hoping for some more Indiana Jones greatness come May.